Basically Bone Gap is one of my favourite novels in the history of ever. I can’t even begin to describe all the entrancing, magical, whimsical, and gorgeous words that fill up this novel! I HAVE SO MANY FEELS. I’ve even read it twice now, and the second time was even more perfect. I’m a huge fan of epic fantasy, but I have a definite weakness for magical realism too. 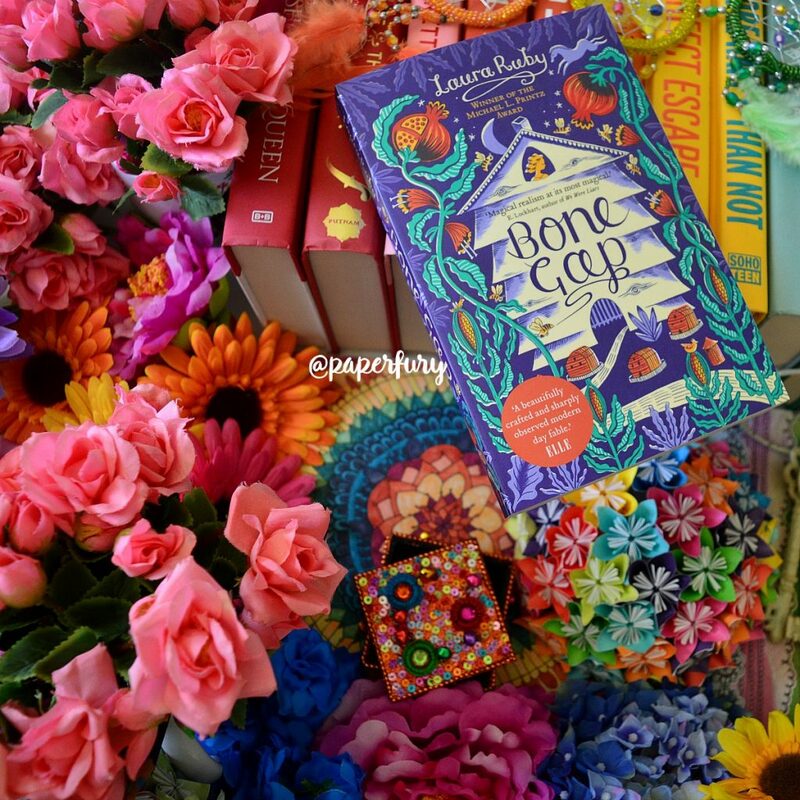 And Bone Gap combines cornfields, honey bees, midnight magical horseback rides, strange faceless kidnappers, small town gossip, tragic brothers, missing people, and complicated emotions ALL SO FLAWLESSLY. THE CHARACTERS ARE SQUISHABLE BEANS OF FEELS. I absolutely love them. They all seem so dynamic and complex, even just after a few chapters. It’s actually narrated by quite a few people, which usually isn’t my favourite, but I just adore how it’s done here. The chapters mostly alternate between Finn and Roza. But we have snippets from other characters too which just makes the book EVEN BETTER SOMEHOW. IT JUST DOES. TRUST ME. FINN: He is so precious and odd and strange and basically an outsider because he’s very vague. He doesn’t look people in the eye and he never seems to know what’s going on. #Relatable And he feels entirely invisible because no one believes him that a strange man kidnapped Roza. I just…Finn…seriously one of my favourite characters of ever. ROZA: She’s a student from Poland, come to study horticulture, and just gets caught up in this catalyst of magical events. She’s very beautiful and motherly and she basically gets adopted by Finn and his brother, Sean, and then she adopts them back. IT’S SO CUTE IT’S ACTUALLY RIDICULOUS. I love all the Polish food she made for them and just how she and Sean fell in love and ADFJKADLFDJ. But she’s also, ya know, missing. SEAN: He’s Finn’s older bro (by about 5 years I think?) and basically Finn’s parent by default since their mother walked out. He’s all hurt that Roza’s gone and not talking to Finn because he thinks Finn’s lying…AND IT’S ALL TRAGIC AND SAD AND I LOVE THEM BUT STAHP, SEAN, TALK TO YOUR BRO. PETEY: She’s all salt and vinegar and bee stings and basically known for being “ugly”, which breaks my heart how the world puts so much emphasis on looks. (That is a BIG point of the book though.) I love how her sharp personality meshed with Finn’s whimsical self. Basically OTP of ever. THE MAGICAL REALISM ASPECT IS VERY ODD. I really liked it though! It is more magical at the end than the beginning, but there’s like little cracks throughout the whole story of strange things. And I just love it. I ALSO LOVE THE SUMMER VIBE. Because summer is nice, dude. All that corn and stuff and bees, two things I am 5000% allergic to but can appreciate reading. Seriously listen to me when I say AESTHETIC. IT HAS GOOD DISABILITY REPRESENTATION. And I will tag this under spoiler although I have heard it said that it’s wrong to treat disabilities as spoilers…but I disagree. Because if a character is finding out things about themselves, then the reader is along for that journey too. So it’s up to you and how much you want to know things before the protagonist does. But anyway! Open at thine own will. Finn also has prosopagnosia, which is also known as “face blindness”. It’s a disability where you can’t remember faces and it can be very scary, because if someone changes their “defining” feature, like wearing new clothes or getting a haircut, it’s very easy to become confused and lost and overwhelmed. And it’s also an “invisible” disability so there’s lots of stigmas around it and people not believing/understanding. Basically my heart was a puddle of feels for Finn. <3 I’m really interested in prosopagnosia because I’m terrible at faces (not to that extent though) and so are a few people in my family. So it was really relatable to me how it was represented. Disability does not equal broken and or damaged and I love how he recognised this by the end. I will say that when Petey finds out that Finn has prosopagnosia, her reaction is inappropriate HURT because she then thinks he only loved her because he could recognise her face because she was “ugly”. I think it was a realistic reaction, even if it was awful to read. And I’m glad it gets resolved and she learns to see Finn. which is such a beautiful message. Like Finn is the one who can’t see anyone but it’s like THEY aren’t truly seeing him either. afjdaksldjfd THE THEMES ARE JUST SO A+ AND ON POINT. EVERYTHING IS BEAUTIFUL AND GORGEOUS. The characters. The writing. The setting. The diversity. I just want to eat it, basically, because that’s what you do with beautiful books. 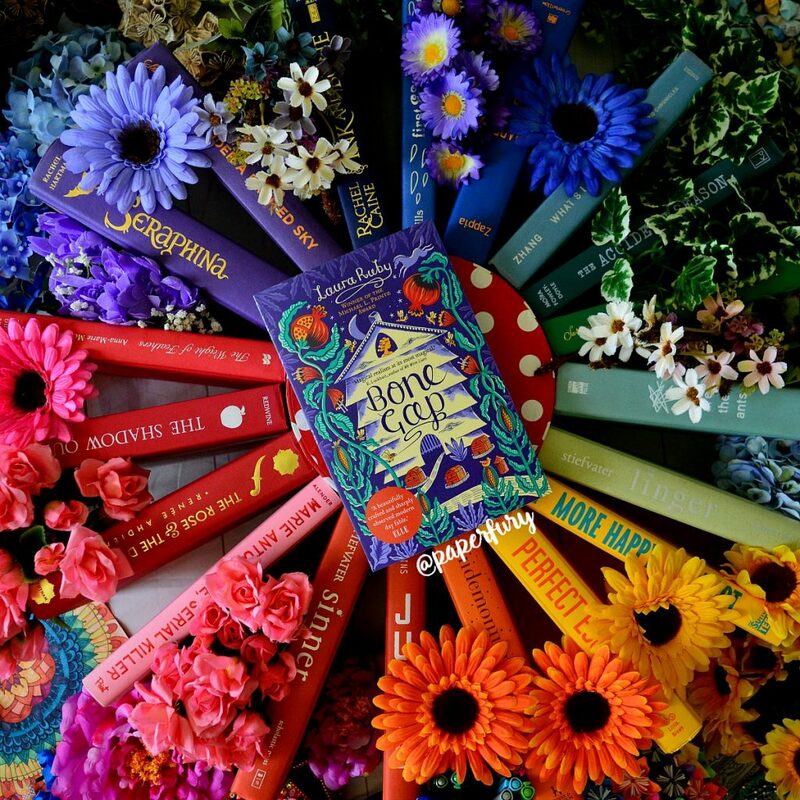 Basically it’s the kind of book everyone needs to devour, especially if you like whimsy mixed with midnight adventures mixed with teens who don’t know what to do with themselves. If you’ve ever felt ignored or overlooked or unseen — THIS BOOK IS FOR YOU. I just adore how it’s about how you see people. And how you can look at a person and not see them. Or you can never look someone in the eyes, but you really truly see them. I GOT NO MORE WORDS. THIS BOOK IS TOO BEAUTIFUL AND I LOVE IT AN EXTRAORDINARY AMOUNT. THANK YOU TO ALLEN & UNWIN FOR THE REVIEW COPY. 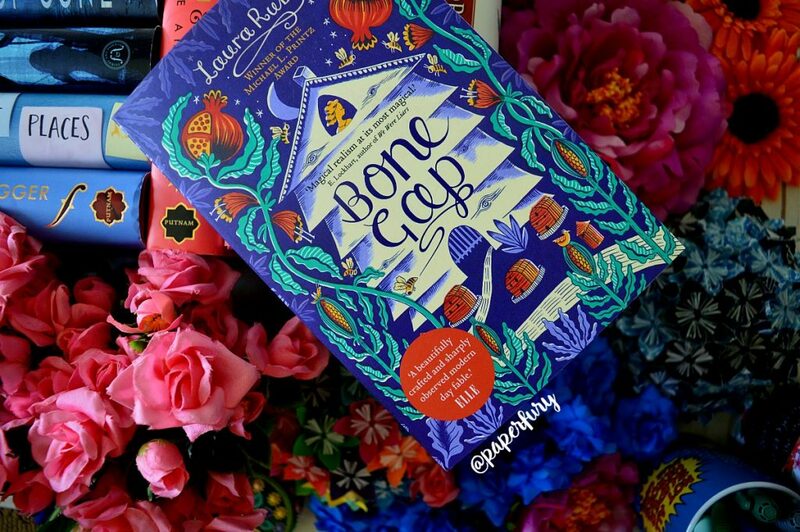 Bone Gap by Laura Ruby is published February, 2017.
do you read much magical realism?! because if you do: pls i need recommendations like i need air. what’s the last book you read with a really RELATABLE characteR? and have you read Bone Gap? thoughts? Wait?? I thought this book was already published? Guess I am just living two lives right now😂😂 But great review Cait!!! I am now so freaking excited to read this book! Plus the names Finn and Sean remind me of the Scorpio Races, I MEAN EVERYTHING STIEFVATER IS GOOD. VERY GOOD. Magical realism is a thing that I cannot live without! It’s my most preferred form of urban fantasy, so I grab any book that has magical realism in it! OKAY THIS COVER DESIGNER NEEDS A PAT ON HIS OR HER BACK BECAUSE DAMN! Also I don’t read a lot of magic realism but I really do want to start so I have to pick this one up hopefully soon! Beautiful review Cait and really good to hear you enjoyed it! I love books with good writing and really odd but adorable characters and this has both so hopefully I’ll enjoy it as much as you seem to have! YES YES THEY DO. BECAUSE THEY’VE DONE WELL. *stares at the beautifulness of this cover forever* And yesss, I hope you do love it too if you get a chance to try it! I’m pretty picky about which books I love these days haha, so when I find one to squish as much as this…omg I cannot stop flailing. Ack! Why is your cover so much prettier than mine? Now I have jealousy. The two books that come to mind immediately when you ask for magical realism are The Saddness of Lemon Cake and The Strange and Beautiful Sorrows of Ava Lavender. I actually love BOTH covers so much, but this one is just a beautiful and glorious collision of all that is lovely in this world. 😍 And omg I want to read The Sadness of Lemon Cake!! BECAUSE CAKE. Welp. I gotta go out that on hold at the library. YES YOU DO ABSOLUTELY YES. AJDFKLSAD I’M SO GLAD WE READ IT AROUDN THE SAME TIME.😍 Well. In my case re-read it, but saaame difference. *flails about with you in wild circles* It is just the most gorgeous and perfect book in the universe. FINN. PETEY. AFJDSKALFDSJ. “Disability does not equal broken or damaged.” WE NEED TO SHOUT THAT FROM THE ROOFTOPS. You are the best ever, Cait. I’ve read it twice now too! So, sooooo good. It is why (and The Weight of Feathers) that I’d like to try & write a magical realism novel some day. And awesome cover! I have the one w/the very realistic bee on the cover (prolly b/c it’s real, lol!). Omg SAME. I want to write magical realism too!! 😍 I haven’t had any actual ideas for it but…it’s on the to-do list.😂 The Weight of Feathers absolutely slayed me with it’s intense beauty though. I just got When the Moon Was Ours too and I’M SO EXCITED. Wow, look at that COVER. It’s beautiful! That in itself is enough to make me give it a second look! And it’s a standalone book as well? Hallelujah! As someone with very little time to read (and apparently an even more difficult time becoming invested), I admit the influx of series in YA books can be frustrating. Sometimes I just want a beautiful, gripping single book to read! This looks like it fits the bill, I’ll definitely check it out! Yes it’s a standalone!!! It’s so beautiful and perfect and fjakdlasdjkl 😍😍 I honestly can’t love it enough. Wow, I started reading the Look Inside on Amazon, and just from a few pages I was absolutely hooked! I’m not usually swayed so easily, but this book is now at the top of my reading pile 🙂 Thanks for bringing it to my attention! You’ve totally sold this to me – although admittedly it was on my wishlist already lol. But I love magical realism, especially when its done well. Another one you might like is one I really enjoyed last year – The Otherlife by Julia gray, its the kind of book where you can’t tell whats real and whats not, but its about two boys and their friendship, and somehow the Norse Gods are mixed up in their otherwise ordinary lives. Definitely an interested read though. Omgggg, I am IMMEDIATELY looking up The Otherlife then. That sounds like my thing entirely.😍😍 And yesss, I hope you get a chance to devour Bone Gap soon though!! I haven’t read this but I’ve read all 3 similar books you recommended (and adored 2/3 of them; the accident season really, really wasn’t my thing) but oamoisdf;asdfk The Scorpio Races and lkajs dfkl;asdj fkl; The Weight of Feathers like OMG I can’t even plz help. Also I adored the other cover of this book (large bee amiright?) and this is equally gorgeous? Omg, I LOVE THE SOUND OF THIS. I’m gonna be honest – I initially turned away from this book, purely because of the weird as heck cover with the bee, because I seriously HATE bees. Even though I’ve never been stung by them, I kinda convinced myself I’m one of those people who’s allergic to them and would die if one stung me?? MAKES NO SENSE, I KNOW. But it’s not like I can just delete that from my head, ok. lol. This cover is so pretty, though, I NEED it on my shelf. And the fact that you recommended The Accident Season and The Scorpio Races as “you might also like”? Makes me want to buy this right this second. THE ACCIDENT SEASON AND THE SCORPIO RACES ARE MY 5000% FAVOURITES TOO. ACKKK I am not sure if I’ll read this??? Because I have a bad track record with magical realism. Usually I just don’t connect with it at all??? Which makes me sad. BUT if I ever get my hands on this one, I’ll try it out. If only because that cover is all kinds of gorgeous. OH GOOD. I hope you like it!! When that insane TBR gets under control, right?! ?😂 I understand the pain! Yes! It was first published back in 2015 actually, and Australia is only just getting it. We’re slow.😂 IT DESERVES ALL THE AWARDS!!! Well, looks like I need to buy this book too. Jeez, going to be broke over here. I mean, I already am, so MORE broke. I want that pretty cover too. I am hit or miss with magical realism, but I think that the characters sound so amazing that I must give it a chance! BUT LOOK AT THAT COVER, SHANNON. IT WANTS YOU. IT NEEDS YOU IN ITS LIFE. I have no idea why I keep passing this book over! Probably, maybe because the only edition I have seen has a giant bee on the cover #offputting. Your photos are stunning. I really like the bee cover haha.😂 But I hope you give it a try sometime! SO WORTH IT. OH MY GOD YES I’M SO EXCITED FOR BONE GAP. It’s been on my TBR for a while, and I absolutely can not wait to get to it. AFKLDSAFD I HOPE YOU LOVE IT AND IF YOU DO, COME SO WE CAN FLAIL TOGETHER SO SO MUCH!! I haven’t read this, but I have seen in in the library, so clearly I need to get to it. I found Emily from the L M Monttgomer y series really relatable because she wants to be a writer too! I really like Magical Realism. Still Life iwth Tornado was really interesting and I loved The Game of Love and Death. You convinced me. Man, you have writing reviews DOWN. I’M SO SAD I DIDN’T LIKE THIS. I feel like I’m missing out on some magical-ness. But ahhhhhh both editions are so beautiful I cry. Must read The Weight of Feathers, too…I think I might like that one. Why does it take publishers so long to release US titles in Australia and vice versa? Ugh. 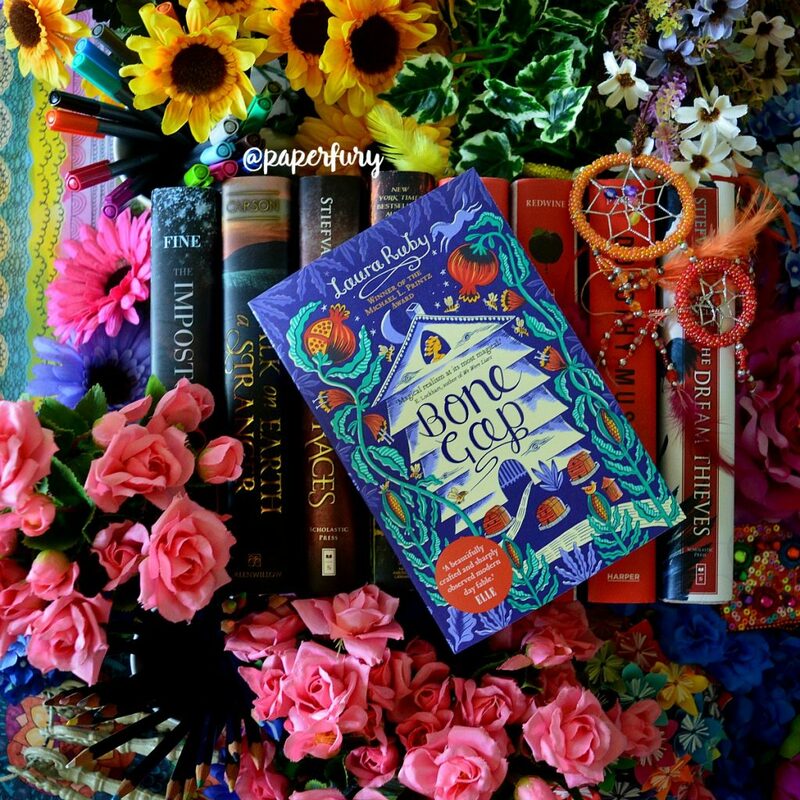 You know I have Bone Gap on my tbr-list since it was released in the US a couple of years ago. Thanks for bringing it to my attention. Your review is amazing and my hands are inching no to have this story. Magical realism is not my genre and I rarely read such books (well except Maggie Stiefvater’s stories), but you were very convincing. PS. Australian cover is so different. And I love this photo with sun made of books. It’s not always a long time! This one was, but often times it happens at the same time. I guess it just has to do with selling rights, I suppose? but I’m so glad my review has inspired you to want to try it!! 🎉 OH GLORIOUS DAY. AFDJKSALD I SHALL HOPE HARD THAT YOU LIKE IT. I’ll bribe you with cake, honey cake to be aesthetic, yes? YES? IT CAN’T GO WRONG. I really enjoyed Bone Gap! It was such a great story! It didn’t get all the stars for me, though, as it was missing something I find in other magical realism; MR generally has a lot of strange and magical things going on, and none of it is explained, but it’s written in such a way that you just accept it, don’t think to question things. No how’s or why’s. But I didn’t feel that with Bone Gap. I didn’t just accept it, I was how-ing and why-ing. And that was a little disappointing, because I like just drifting off on a MR story. But this was still pretty good! And I loved the disability rep. So different from Holding Up the Universe where it was acquired rather than something that was there from birth. I think the fact that odd things were happening was what allowed it to be surprising to me as a reader. Because there are certain elements of the story that would have worked as contemporary, and have been true, but odd. But magical realism, and a lot is odd, so it’s not that noticeable. Does this make sense? I’m trying not to give anything away for people who may be reading this comment but haven’t read the book, haha! Oooh, other magical realism novels! You already know about Anna-Marie McLemore. There’s also The Strange and Beautiful Sorrows of Ava Lavender by Leslye Walton (no typo in the name), have you read that? About a girl born with wings, but also her family for a couple of generations before her. And there’s The Snow Child by Eowyn Ivey, which is a retelling of the Russian folk tale. It’s adult rather than YA, but it’s so good! About a parentless couple, how they make a snow child and wish for a daughter, and then a little girl turns up. IT’S SO GOOD! Kind of literary, too, though. I don’t know if that would be your bag. OH I AM SAD. 😭😂 But fair enough! I mean, sometimes that’s why I really like magical realism? We’re in a world were beautiful and mysterious things happen and it doesn’t get over-explained away with tedious science or details or something. It’s just plain and simple: MAGIC. And I love that!! Oh but Prosopagnosia can actually be acquired. Since it’s actually considered brain damage. So that’s two sides to the same disability, and I did actually like how HUTU represented it! I have actually read The Strange and Beautiful Sorrows but I didn’t like it haha. SORRY. I want to read Snow Child though! I really enjoyed this book, though I didn’t adore it quite as much as you did because it took me a little while to get into it. I’m curious if reading it again would be even better because I know what I’m in for. Oh, and the cover you have is so incredibly GORGEOUS and I’m jealous because the US version is ugly and boring! So I just finished reading this book, per your intense fangirling, and IT WAS SO AMAZING OMG. I’ve never read magical realism and I need more!!! Finn and Roza and Petey were amazing. And I sort of ruined it for myself by reading the publisher’s summary thing (where it talked about “Finn’s inability to recognize faces”) but oh well. The only thing that I didn’t like was Petey and her “omg the only reason he likes me is because I’m ugly and he can see me gosh I’m hideous” while Finn’s over here just feeling BAD FOR HIMSELF AND FEELING DAMAGED LIKE HELLO. But like you said, it was realistic. Just… annoying. AHHHHH I’M SO GLAD YOU READ IT TOO!! (Although so annoyed the publishers ruined that aspect for you *shakes fist at them*) Petey was so precious and relatable. <3 I wish she hadn't jumped to conclusions BUT I get why she did. It totally made sense. Finn was such a poor precious cinnamon roll. <3 I'm glad the book didn't send the message that he was broken for his disability though! Just different! 💕💕 HE'S SO MY FAVOURITE. First I want to say that I love reading your blog! You have great comments that are both hilarious and genuine. You’ve made me laugh so hard sometimes that I have to stop reading and come back to it when my boss isn’t looking. I’m the teen librarian for my jail’s library (inmates are basically teenagers) and your reviews and recommendations are perfect for collection development. 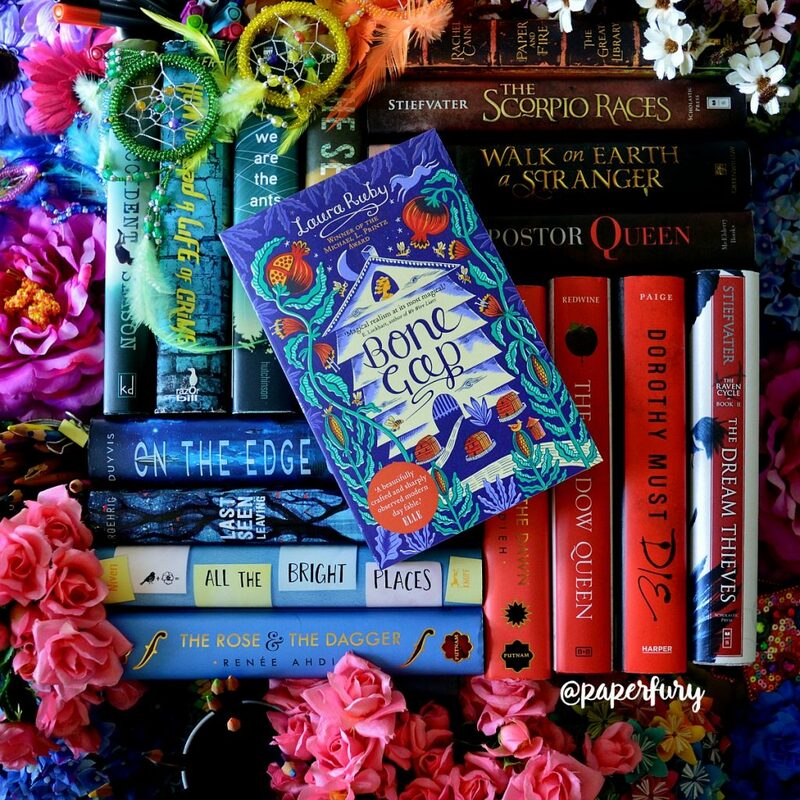 Second: I just finished Bone Gap and I also felt ALL THE FEELS! I had been wanting to read it for a while and when I finally did I basically ignored every other adult thing I needed to do just so I could finish the book. I loved what you said about following a character’s journey and finding out with them that they have a disability…that part left me speechless how well the author framed that in the book. I also loved the nod to Greek mythology. I felt like Roza was basically Persephone; she makes cookies with pomegranate, she mentions in the final scene with the faceless man how the people around her were basically dead, and the man only wants her because she is the most beautiful. The author didn’t make it overt which I really appreciated. This book was incredibly well-crafted and I loved reading your thoughts on it. Anyway, I think you have an amazing blog and my read alike recommendation would be The Secret Life of Bees by Sue Monk Kidd. It’s not YA but the two main characters are teens and the book is LOVELY. And omg I didn’t see the Persephone thing until now, but I TOTALLY see it. I agree!! The book is just so layered and beautiful and i’ve since read it twice but honestly I can’t get over how beautiful and perfect it is. And I’ve heard of The Secret Life of Bees! I really need to check that one out. Thanks for the rec!